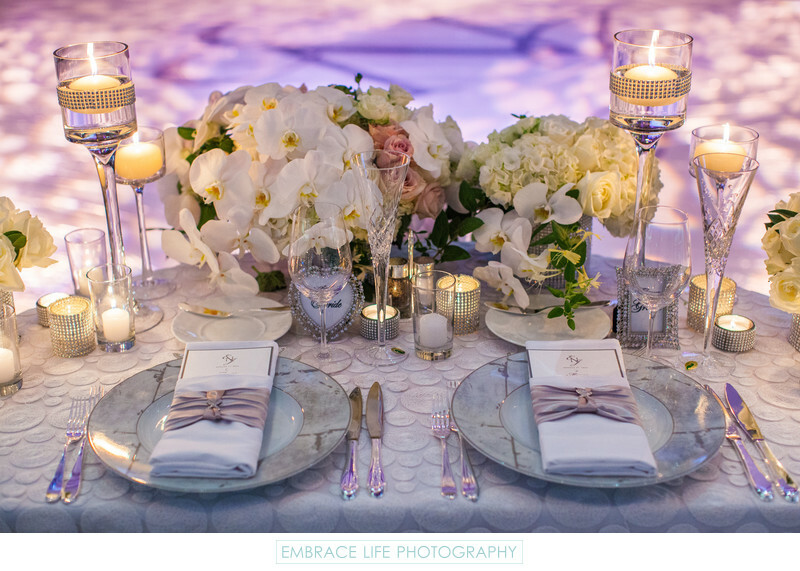 Close-up details of the sweetheart table at this Los Angeles wedding reception at Skirball Cultural Center in the Cotsen Auditorium, showcasing the wedding planning prowess of Linda Howard Events. A modern, textured table linen is covered in beautiful details including stunning flower arrangements by Hidden Garden, dinner plates reminiscent of the concrete found through the Skirball Cultural Center's modern architecture, elegant napkins, monogrammed dinner menus, bejeweled votive and tall glass candle holders and picture frame place cards for the bride and groom. Behind the sweetheart table is a white dance floor covered in a purple wash and warm patterned event lighting by The Lighter Side.